Earlier this year, my sister and I celebrated her youngest daughter’s third birthday. My niece enjoyed many of her gifts, but the one she was most excited about was a smartphone. Even though she has to share it with her three older siblings, they are rarely willing to fight her for it since she’ll just kick and scream. After her siblings give up trying for a turn, she immediately quiets, a blank expression basking in the blue light of Youtube. Her siblings turn to other devices: iPads from school, the home desktop computer that now seems ancient, or maybe just their mom’s smartphone. They’ll usually use these while also watching television. Indeed, families have shown that they consider digital media an integral part of their daily life. Digital media can be defined as any form of media accessed by a machine. This has long included TV, and more recently expanded to computers and smartphones. Newer forms of digital media tend to be more interactive, and as such, tend to be more absorbing. That said, now more than ever it is crucial for us to interact with kids as they use digital media in order to reinforce healthy behaviors. Kids in the 1970s started to regularly watch TV at the age of four, whereas today kids begin interacting with digital media at four months. This is significant because most human brain development happens before the age of one. Since the early days of TV, it has been understood that digital media promotes unhealthy behaviors. Research has shown that digital media use increases the risk of obesity and heart disease with each hour it is used. Other studies have shown increased risk of speech delays, thought to be due to less interaction between parents and kids. Sleep disorders, behavior issues, and depression can also occur. Content for newer digital media is also not as curated as it is with TV. For example, anyone can share videos online which might appear kid-friendly, but may not be entirely appropriate for kids. The good news is a lot of these risks can be reduced. Despite many studies, there has been no causal link shown between digital media use alone and obesity in kids. Rather, research shows that digital media use frequently leads to a lack of physical activity and poor nutrition which then result in obesity. However, research has also shown that even just switching to high-quality digital content curated by studios such as PBS can reduce certain risks of digital media use significantly. Co-viewing has also been shown to be protective. Co-viewing means using digital media with kids to help them understand what they are seeing and apply it to the world around them. Think of it like reading with a young child; you wouldn’t just give them a book and walk away. All this is to say, perhaps the problem is not just the use of digital media, but how we’re using it. The solution is for families to moderate their digital media use. One good resource is CommonSenseMedia.org, an online nonprofit website that reviews what digital media is high-quality for kids. 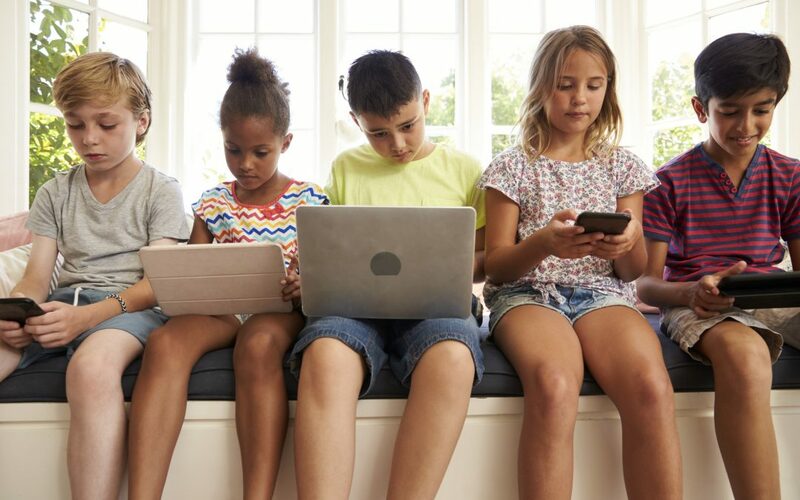 The American Academy of Pediatrics also released new recommendations this past year to serve as goals for healthy digital media use. Screen time should be avoided for kids less than 18 months of age because they require more hands-on exploration, such as with toys, to learn well. Screen time should be limited to 1 hour for kids of age 2-5 years and consistently limited at parents’ discretion after that. At any age, co-viewing is strongly recommended, and use is strongly discouraged in bedrooms. It is also useful to set media-free times, such as during meals or before bed. Families can go to HealthyKids.org/MediaUsePlan to map out these goals, and discuss them with their primary care provider. At United Family Medicine, our providers are passionate about helping families set and achieve goals to live healthier lives. We encourage you to come to us with any questions to help craft your family’s media use plan.